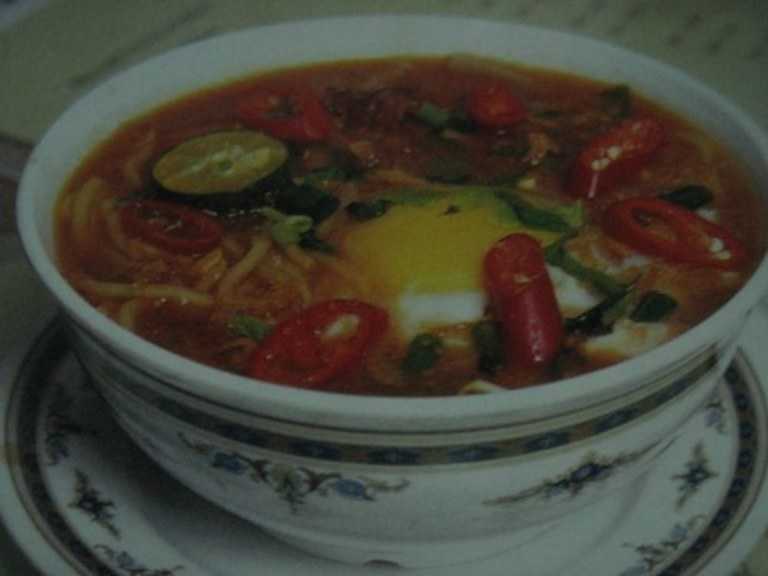 Mee Bandung Gravy 1. Bring a pot of water to a boil. Add in sliced shallots, garlic, local celery, tomatoes and crushed ginger. Reduce to low heat and simmer for 3-5 minutes. 2. Add in beef broth , prawn cube, tomato ketchup and chilli boh. Stir well and adjust seasoning with sugar to taste. 3. Simmer for 5 minutes and strain. 4. Put the pot holding the gravy back on the stove and gradually add in beaten egg white. Remove and keep warm. To serve: 1. Blanch yellow noodles in a pot of boiling water for a few seconds. 2. Remove, strain and place it into serving bowls. 3. Add in sliced fish cake and blanched beansprouts. 4. Pour in hot Bandung gravy and garnish with shredded chicken, sliced spring onions, local celery, chillies, fried shallots and calamansi. 5. Serve hot.